In the early 1980s, the hospital, then known as Columbia-Presbyterian Medical Center, elected to stay in Washington Heights. It was an important commitment at a time when the neighborhood was at a nadir, plagued by violence and drug abuse. That commitment was soon matched by the opening of Coogan’s in 1985. It was run by its founders Dave Hunt and Peter Walsh, and their less visible partner Tess O’Connor McDade. Hunt and Walsh set out to create an inclusive bar in a neighborhood divided by race, ethnicity, geography, and social class. They started with the integrated workforce of Columbia-Presbyterian and added police officers heading home to the suburbs. The formula worked, and Coogan’s was on its way to becoming one of the most amiably integrated places in New York City. Coogan’s is no ordinary watering hole. 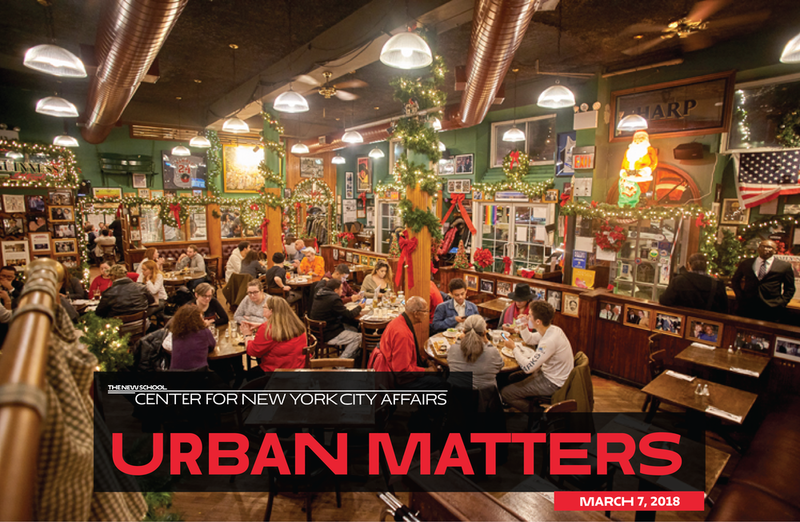 In Washington Heights, a neighborhood that has long lacked a central meeting place, Coogan’s became the common ground where African American, Dominican, Jewish, Irish, and LGBT New Yorkers—to scratch the diversity of the crowd—learned to share space and get along. In a neighborhood with a history of ethnic tensions where the violence of the drug trade was only a few blocks away, this was a real achievement. Coogan’s also provided a convenient place to eat for hospital staff and warm hospitality for friends and relatives of people undergoing treatment. When the father of my friend Dave Crenshaw was in the hospital and needed constant attention, Coogan’s let his family run a tab so they could concentrate their energy on visits. But Coogan’s—thanks to people from the nearby hospital who walked through the front door—produced more than good beer and good vibes. In meetings and conversations, formal and informal, Coogan’s helped the hospital do its work of healing a community wracked by violence, drug abuse, poverty, AIDS, and fear. In 1999, Coogan’s sponsored a five-kilometer footrace, “Salsa, Blues and Shamrocks,” that restored scarred streets to runners, live music and cheering crowds. The New York Road Runners now organize the race, but Coogan’s continues to run a post-race breakfast. Proceeds from the meal support a program in the Dominican Republic, founded by Dr. Stephen Nicholas, a pediatrician at the Mailman School of Public Health at Columbia University, which treats families with AIDS. In turn, students at the Mailman School of Public Health have used Coogan’s as both a hangout and a place to raise money to support the “Uptown Dreamers Team,” a local sports program that is sponsored by the alumni of P.S. 128—which is right across Broadway from Coogan’s. After the proposed rent increase at Coogan’s become known in January, more than 15,000 people signed an online petition supporting the restaurant – in just three days’ time. Elected officials from the neighborhood and the borough also stepped in, as did neighborhood celebrity Lin-Manuel Miranda, the playwright of Hamilton fame, and his father Luis Miranda, a political consultant of note. In the face of this upwelling of support, the hospital agreed to go back to the negotiating table with the restaurant and a new deal was quickly struck. While the terms of the new lease aren’t public, the doors to Coogan’s have stayed open. As I observed researching my book Crossing Broadway: Washington Heights and the Promise of New York (Cornell, 2015), Upper Manhattan’s recovery from the traumas and violence of the crack years was achieved largely by what the sociologist Robert Sampson calls “collective efficacy”: a sense of “social cohesion” grounded in an expectation that when things go wrong, residents can count on at least some people to help set things right. The rescue of Coogan’s was collective efficacy in action. Coogan’s, where people of many different backgrounds learned how to share space and get along, reaped the benefits of the cohesion it nourished. At the launch party for my book (held at Coogan’s, naturally), Dr. Mindy Thompson Fullilove of The New School talked about how, in a study of the crisis years in Washington Heights, she and her colleagues found that community residents needed a place to voice their problems and share solutions. They found that in Coogan’s. In retrospect, the good guys won at Coogan’s because they were organized and connected to elected officials. Equally important, they faced a landlord—an educational institution-- sensitive to public pressure. That’s a special case. 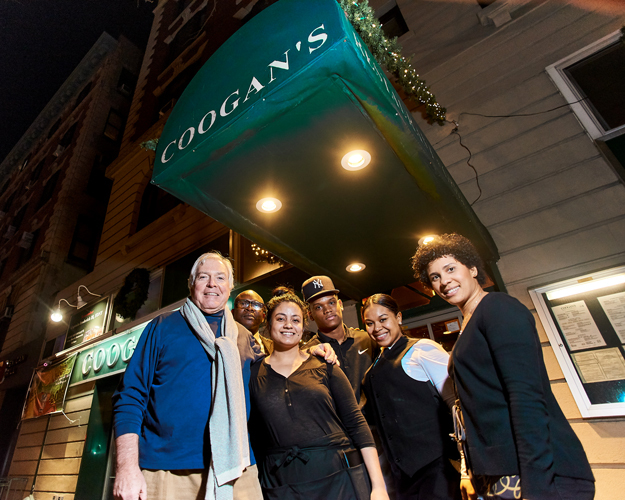 Nevertheless, the lessons of collective efficacy learned in the battle for Coogan’s might help save other businesses, all across New York, on other days. Robert W. Snyder, author of Crossing Broadway: Washington Heights and the Promise of New York (Cornell, 2015) is a professor of Journalism and American Studies at Rutgers University-Newark.